I am an #mbtos -er…. I get to be the sponsor for my school’s chapter of Mu Alpha Theta. This is an awesome group! Unfortunately, all but three students graduated last year, and one of those transferred to the new school!😩. Common Core Aligned Lessons: Rich Tasks, or Same Stuff, just re-aligned? I got an email from Achieve just this week inviting teachers to start testing the lessons on the Achieve the Core website. I was so excited! All of this with one search tool! I clicked through: There were lessons for every standard! I clicked again: For every grade! I quickly clicked on the lesson promising to teach students to find the zeroes of quadratic equations (that’s such an important concept and I was looking to expand on the rich task we used in the workshop). And then… Well, does anybody remember the sound the record player made when the needle would slip and slide across the vinyl?? Since attending Common Core Standards training this summer, where we learned how to implement rich tasks for conceptual learning, and learning about Dan Meyer’s work, I have been interested in sources of these strong lessons and in modifying many of my existing lessons. The Stanford class ‘How To Learn Maths’ cemented my desire to get even better at teaching math through numeracy, rich visualizing, and good questions to get students thinking about what the numbers they are using really represent. I fast-forwarded to the instructions for the lesson: graph (using the calculator) four given quadratic equations and identify the zeros. Hmmm. How are they supposed to know this? I checked the prior knowledge column on the lesson plan. Nope. Nothing about zeros. The current knowledge column (remember: the goal of the lesson) was that the student ‘would be able to’ find the zeros of the factors of the quadratic. Factors? But we didn’t factor anything. Oh, wait, it says here that factoring is the next lesson! STOP!!! Where is the rich task? Where is the productive struggle? Where are the mathematical practices? This great lesson, common core aligned and all, appears to be more of the ‘feed kids details and have them take notes’. Even the group activity, having them find the differences in the graphs isn’t creating the conceptual understanding of what they are doing, what the graph represents…. Can you feel my frustration here?! We (teachers) are going to have to undergo a shift in thinking about what good lessons look like. It is going to require kicking out textbooks and no longer training students how to get good at multiple choice tests. This is a paradigm shift. Yet, here is the Achieve the Core website leading teachers to more of the same dry, lecture heavy, notes and memorization-filled stuff! In the interest of good reporting, I went to two other lessons, one for sixth grade on fractions, and one for eighth grade algebra. They were similarly structured. The Common Core Challenge was developed as part of the Common Core Teacher Institute held on October 6th at NBC News’ Education Nation 2013. This is your chance to give them feedback on these lessons. Let’s give our teachers every chance to succeed in the classroom, because this is the only way our kids will succeed. That success will transfer to a confidence that we won’t need standardized tests to see! Seriously, though, sharing good lessons so that we don’t have to create our own and giving feedback to make good lessons better will allow us to improve what is happening with students across all disciplines, across all schools and across all SES. 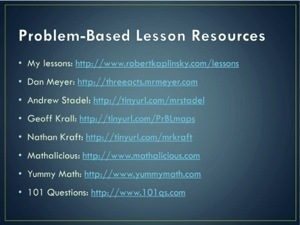 I have found the most wonderful group of teachers and resources and community through the MTBoS site and through Twitter ( I am @the30thvoice), so I know my teaching is going to get better and my students are going to be challenged. How a students starts is out of our control, but how a student finishes is in large part due to how he/she is taught. Be that teacher for your students! I have been assigned a room full of bright six-graders. They are successful; achieving high proficient scores – they are students who are “on the bubble” of scoring at the advanced level. A review of their work reveals the problem: Operations with fractions. My goal is to help them create a stronger conceptual understanding of fractions, in order to allow them to be more successful in their fraction interactions! The initial lesson involves some baby steps, in order to formatively assess the understandings about equal sharing, naming shares and rebuilding wholes. Materials will include the students themselves and a fair share box (see attached image- thanks to Jere Confrey). I tell them they are going to gather in teams and ask them to come up with ways that we can divide the class so that each team has an equal number of students, WITHOUT COUNTING FIRST. At this point I am not looking for anything but suggestions on grouping. I will use thinking questioning to get them started, clarifying q’s to help them express ideas and repetition: students repeating what others have said. The students will then be asked to critique, analyse and decide how best to group. They will use a method they decided upon to create the teams. We may need time for trial and error here, as well as how to divide ‘leftovers’ when the class does not divide evenly! Q: (work on in groups) How would you describe your team in relation to the rest of the student teams in the room? ( this is where I will go around and listen to what the students think about their relationship to the other groups. I want to find out about their level of expertise with the language of groups- I anticipate that I will get anything from ‘one group of five students out of 20’ to ‘1/4 of the whole class’. I will have the students share their comments and ideas. I will then let the students give each other feedback on the reasonableness, accuracy, and will take the opportunity to guide the vocabulary for the discussion, by restating, and asking students to restate. At this point, I expect to have identified any conceptions about fair sharing and language of sharing the students have. How many students in each team? So what can we say about each team? I will have the students tie their comments to the chart, walking through the naming conventions they use. If there is not a connection to fractions in the discussion, I will shape my questions: ex. Do they see another way we could name each group in relation to the whole? I would flip the table at this point, to show the connection to the fractions they usually see. I want them to make the connection from part to whole. After this discussion, I would reinforce the problem solving with the penguin problem, (how do we share 30 snowballs among three penguins?) using small groups. At this point, I will be checking in with each group to hear what they are saying and to reinforce the ideas of sharing, naming and reconstructing. I will be listening for understanding. All of this should only take a fraction of the lesson time. I am asking the students to think about fractions in a primary way, to connect the more elaborate work of operating with fractions. The students will be encouraged to use the language of fractions, wholes and reconstructing as they work with grade level problems involving fractions. Students will be encouraged to break down fractions or reconstruct them to assist in solving problems, with drawings, with manipulatives, or using the fair share table. Then they could begin to operate with the fractions, understanding how to combine groups, and in further lessons, what happens when groups are multiplied and divided. I see my understanding of how children instinctively do this work informing my ability to identify students who have “lost” or buried the skills and to assist in reconstruction of this knowledge to enhance and strengthen their future conceptual understanding. Common Core State Standards (CCSS) are lists of things kids are expected to learn in each subject during each school year. They are not the actual lessons. Your child’s teacher and school system will decide what lessons to teach and how to teach them. Research shows that one of the best ways to teach children is to give them tasks and have them work through the solutions to the tasks. The child is given directions as needed, or small lessons on specific skills, but the child is allowed to figure out what skills they need, or what they need to know, to accomplish or solve the task. These are called Key Tasks. To be able to participate in the process of Key Tasks, a child needs to have a way to approach and organize the information. In mathematics, this process is going to feel very different than the existing process of “show the child the problem, work the problem with the child, and then let the child practice problems. Without setting up the structure of the process first, students may feel that the teacher has abandoned them, is not really teaching them anything, or worse. It takes time to transfer responsibility for problem solving when a child has never been asked to shoulder the responsibility (except for remembering how to do some practice problems, or work a formula – not really learning, just memorizing and regurgitating information). The process of approaching and organizing the information is very similar to the scientific method. Any teacher or parent can help a child learn how to approach these new key tasks by teaching them a “mathematical thinking” process. The steps in the process are simple ones: Read and think about the problem, draw the problem or restate the problem, discuss the ideas about the problem with others or use resources (group discussion), estimate the answer, “mathematize” the problem (a formula or equation), try/refine/rethink, see if the answer makes sense. These steps may need to be used more than once throughout the process. As you can see, the actual answer is only a tiny part of the process. I love the idea of math as a thinking process. Instead of just giving students the list of actions, , I would approach this the same way I like to approach setting up classroom norms. I would start with a sample problem and just have the students think about it. I would tell them not to try and solve it yet. Then I would have them verbalize their thoughts in small group and then whole group- we would write the thoughts/assumptions on a big sheet of paper titled ‘Thinking’ and tape it to the board. I would facilitate with clarifying and summarizing questions. The next step would involve visualizing. Students would be asked to draw a picture to illustrate what they saw happening in the problem. Again in small groups, they would create a picture/illustration, titling the poster ‘visualize’. The posters would go up around the room. At this point, I would ask all students to move around the room ( in groups) and visit the posters to see if the illustrations made sense, and if they suggested any mathematical way to look at the problem. Returning to their seats, each group would create another poster titled ‘mathematics’ showing the calculations / solutions that they came up with. Those would go up on the wall. Each student would then be instructed to visit each mathematics poster and decide if those mathematics/answers made sense in light of the problems. This might be a good place for the students to use sticky notes and place comments or questions onto the posters. The groups would then go back to their posters, check out the comments (as would I, so that I could come up with more questions) and we would come back to a whole class discussion to examine the various mathematics and reasonableness of answers. I might put up an empty poster titled ‘revisions’ so that students could add ways that they will need to revise their own thinking to solve this and future problems. The summing up of the lesson will not be right or wrong answers, but a summary of the process itself. The students will be asked to discuss with one other person what steps they went through to solve the problem, and then write a brief paragraph in their math journal about what steps they took to solve the problem. The final poster, and the one that will remain on the wall for future work, will be the steps the students noticed were common to the process- maybe have each group list a step (different colors, handwriting?). This will give them a roadmap to solving future problems- and as the teacher, I will give them the time to use the steps as we move through the learning process. Parents can help by giving your children the time to verbalize problems to you or draw what they think the problem represents. You don’t always have to know how to do the math to help your child think through the process. Even if they don’t come up with a “right” answer, or maybe all they have come up with is questions, the thought process is going to give them a way to get in on the next conversation in class.